How do you interpret your life? Often things in our lives don’t seem make sense or feel right – so what is it that gives you clarity, purpose, joy, hope? What do you use to understand your circumstances, especially when things get rough? There’s a basic premise that just about everyone one of us on this planet shares – a pattern for how we view life. We believe their is a way life ought to be, the way it is, the way it can be and the way it will be. We see this pattern in everyday life and in movies, novels, songs and art. This pattern also is found in Scripture. We imagine the way life ought to be because of Creation. We were designed for a perfect relationship with God and other people. We recognize the way it is as not quite right because of Corruption. We live in a fallen, broken world. Our current reality doesn’t line up with God’s original intent. When we think about the way life can be, it’s because of Redemption. Deep down we long for renewal, for freedom. And through Jesus, God offers a solution for our fallen condition. We dream about the way life will be because of what the Bible calls Restoration. One day, God will restore everything in creation to its original intent. He will make all things new. So ought, is, can, and will is simply a way of using secular language to talk about Creation, Corruption, Redemption, and Restoration. 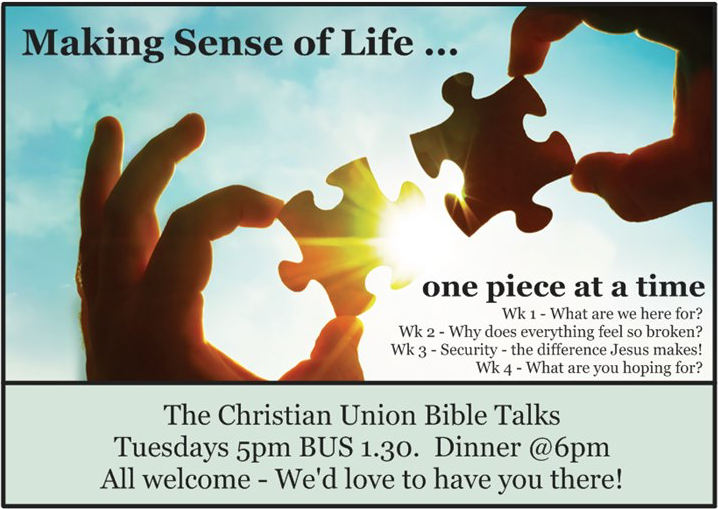 Whether you’ve been a Christian for a long time or if you’re just checking out who Jesus is, we’d love for you to join us at ‘The Bible Talks’ as we let God’s word put the pieces of our life together! 5pm Business 1.30 Tuesdays of term.